Mongooses are weasel-like creatures that belong to the family Herpestidae. They have non-retractable claws, which mean that they can't hide them when they want. Their claws are visible all the time. There are 34 species of mongoose. Mongooses produce alarm calls when they spot a danger. Mongooses are primarily found in Africa, their range covering most of the continent. Some species occupy parts of southern Asia and the Iberian Peninsula. And some species of mongoose have been introduced into other areas of the world, such as Caribbean and Hawaiian islands. Once annually, they produce high-pitched sounds called "giggling" to inform others that they are ready for mating. They are generally terrestrial mammals, but some are semi-aquatic, and others are at home in the treetops. Mongooses live from 6 to 10 years in the wild and up to 20 years in captivity. With so many different species of mongoose, sizes vary greatly. The smallest mongoose is common dwarf mongoose (Helogale parvula). It grows to from 18 to 28 centimeters in length and weighs 210 to 350 grams; in fact, it is Africa’s smallest carnivore. Large group of mongooses protect their young by attacking predators with their sharp claws. The largest mongoose is white-tailed mongoose (Ichneumia albicauda). It has a head-and-body length of 53–71 centimeters (21-28 inches) and a tail length of 40–47 centimeters (16-19 inches) and weighs about 5 kilograms (11 pounds). Some mongooses are solitary, while other live in large groups called "packs". The typical mongoose has a long-shaped face and body, short legs and little round ears. They normally have brown or gray grizzled fur, and a number of species sport striped coats or ringed tails. A few species lead predominantly solitary lives, while others live in groups called “packs”, “colonies” or “mobs”. Mongooses live in abandoned burrows. They rarely dig burrows on their own. Packs can have as many as 50 members. Mongooses are diurnal, which means that they are active during the day and sleep at night. They live in burrows made of a complex system of tunnels or in trees in many different types of landscapes, including deserts and tropical forests. Mongooses tend to live in burrows that other animals have abandoned. They rarely dig burrows on their own. They have become immune to snake toxins and they can survive more than one snake bite in their lifetime. The mongoose is a small animal but an excellent hunter, with keen senses of smell, sight and hearing, and remarkable reflexes. Mongooses are mostly carnivores, feeding on insects, crabs, earthworms, lizards, snakes, rodents, and other small creatures. However, they also eat eggs and carrion. Mongooses are very fast and agile creatures. They can defeat venomous snake thanks to these features. The Indian gray mongoose and others are well known for their ability to fight and kill venomous snakes, particularly cobras. They are adept at such tasks due to their agility, thick coats, and specialized acetylcholine receptors which make it, not fully immune, but relatively tolerant of cobra venom. They use solid object to crash the shell of the egg or they throw eggs to the hard surface to break them. Female has one litter per year that consists of 4 babies. They are born blind. Once annually, they produce high-pitched sounds called “giggling” to inform others that they are ready for mating. Mongooses have gestation periods of 42 to 105 days and give birth to one to six offspring at a time. A baby mongoose spends most of its time playing and wrestling with litter mates while the adults in the pack forage. When an adult uncovers a beetle, digs up a millipede or snatches an egg, the pups forget about play and beg for a meal using high-pitched chirps like baby birds. Youngsters of most species remain with their family group for life. Mongooses are carnivores (meat-eaters). They eat rodents, birds, frogs, insects, eggs. The natural enemies of mongooses are snakes, hawks, jackals and storks. 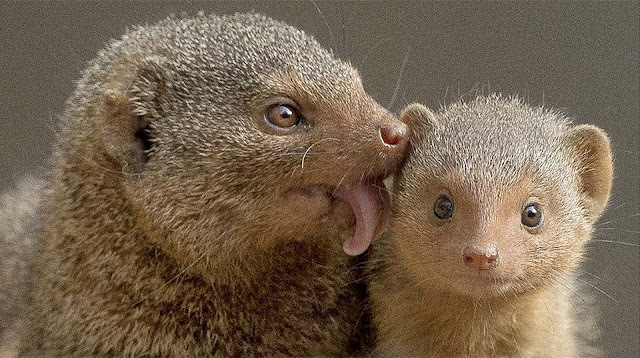 The word “mongoose” is derived from the Marathi name mungūs. The form of the English name (since 1698) was altered to its “-goose” ending by folk-etymology. It has no etymological connection with the word goose. Several species of mongoose show an example of simple tool use by throwing or dropping eggs, shellfish and nuts against rocks to open them. The average top speed of a Mongoose is 32 kilometers (20 miles) per hour. They have grayish or brown fur, and some of them have striped coat and ringed tail. The mongoose has horizontal pupils. Despite popular belief, mongooses are not rodents. The meerkat is a species of mongoose. Smallest mongoose (dwarf mongoose) can reach 10 inch in length and weigh up to 0,5 pound. Largest (white-tailed mongoose) can reach 28-30 inches in length and weigh up to 8 pounds. The ancient Egyptians domesticated these wild creatures and considered them sacred (mummified bodies have been discovered in tombs). The Buddhist god of wealth Vaiśravaṇa, or Dzambala for Tibetans, is frequently depicted holding a mongoose that is spitting jewels from its mouth. The Hindu god of wealth, Kubera, is often portrayed holding a mongoose in his left hand, hence the sight of a mongoose is considered lucky by some. Mongooses live around 4 years in the wild and up to 20 years in captivity. Mongooses are a common spectacle at roadside shows in Pakistan. They also use scents to announce their reproductive status and to mark territory. Snake charmers keep mongooses for mock fights with snakes. A well-known fictional mongoose is Rikki-Tikki-Tavi, which appears in a short story of the same title in The Jungle Book (1894) by Rudyard Kipling.